I’ve been around design and engineering for many years. Well, you might say that I’ve been “around the block.” I can accept that, but I also have realized for a long time, that to remain relevant, I have had to continuously re-educate myself through various channels to reinvent myself. Just last autumn I took a computational physics course (Optics) at the University of Colorado Denver as background for a book I am in the process of writing on 3D scanning. To say it was a challenge is an understatement, and I had to dust off my old college math books, but I got a lot out of it and look forward to future college-level courses. Disclosure: I audited the course and did not receive a grade, but felt I kept up with the class, and missed only two classes during the 16 week semester. We just left Scottsdale, Arizona after a great weekend at the annual Congress on the Future of Engineering Software (COFES) event. Over the years I’ve attended probably 8-10 of these unique events, and they have all been a bit different, but I have always come away with new insights and perspectives on engineering software. The keynotes are always thought provoking and the roundtable discussions and general conversations are stimulating, because they often provide food for thought and questions for further investigation rather than just simple answers. This year’s theme was “Taking a Step Back To See the Big Picture.” As engineers and software professionals we are good at focusing on the thing at hand – the design challenge; the need for a new tool; our competitive situation. However, rarely do we consider the bigger world in which these issues reside.This year, COFES took a giant step backwards for broadening our view. In other words, to think about thinking about the bigger picture. The nature of our work requires that we spend the majority of our time getting things done, tightly focused on executing our tasks and plans. And while we do that, we are continuously faced with choices, big and small, along the way. Too often, we make decisions in the narrow context of what we have in front of us, unless some outside force pushes a broader context into our consciousness. What most of us take for granted when using CAD/CAM/CAE technologies had to come from somewhere, correct? By that I mean the mathematics that underlie and drive all CAx applications. From the basic math numerical models are derived as the output of systems. The output of these systems are geometric shape descriptions of modeled objects. As these systems were being developed a new branch of mathematics, known as geometric modeling, was created – and that’s what the book, Geometric Modeling, is all about. Fundamentally, geometric modeling studies the methods used to construct and control numerical geometric models of real and imaginary objects. Geometric modeling is entirely dependent of several areas of mathematics, but primarily differential geometry (that employs differential and integral calculus and linear algebra for developing planes, curves, and surfaces in 3D Euclidean space) and numerical methods (to find numerical approximations – the more precise the approximation, the better the model). How basic math becomes numerical modeling that becomes geometric modeling is the subject of a new book, Geometric Modeling, by Dr. Nikolay Golovanov. The book is based on the author’s experience gained throughout his career, and especially during the development of the ASCON Group’s C3D geometric kernel as a principal architect. In a nutshell, the book outlines the methods of geometric modeling, including methods for constructing curves, surfaces, and solids. It describes the algorithms and data structures behind geometric objects. It also presents the principles of the interconnections between the elements of geometric models. 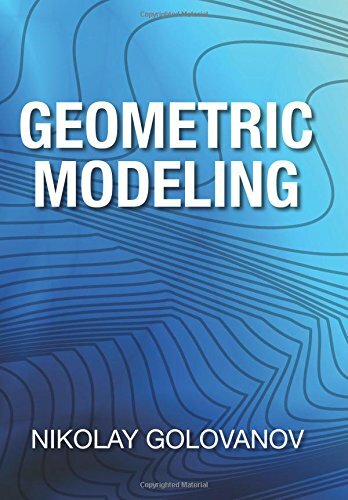 Finally, the book examines some of the applications of geometric models, such as determining model physical characteristics, rendering, simulation, etc. We talk with dozens of CAx vendors monthly and on an ongoing basis so we can (hope to) stay current with new features and capabilities. We have also noted for several years the ongoing consolidation of CAx vendors. When I blogged specifically a couple months ago about the CAM segment entitled, “CAM Consolidation 2015: The Circle Continues To Get Smaller,” only one vendor challenged me that it was always independent and would remain so – SolidCAM. That statement piqued my interest, so I thought I better follow up to see how they would substantiate their insistence. The following video demonstrates a 3D car model machined in C45 steel roughed with iMachining 3D technology, which SolidCAM claims saves >70% of machining time. The car model is finished using SolidCAM 5-Axis simultaneous – all integrated into SolidWorks. Shortly after SolidWorks World, I spoke with SolidCAM’s founder and CEO, Emil Somekh, in a lively and candid conversation that set a number of things straight specifically about SolidCAM, as well as the CAM industry in general. 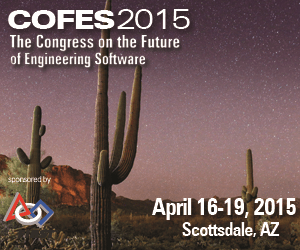 If it’s April, it’s time for COFES (Congress On the Future of Engineering Software). This annual informal event, now in its 16th year, is the engineering software industry’s only think tank/industry summit event that brings executives from design, engineering, architectural, development, and technology companies together to understand the role engineering technology will play in the future survival and success of business customers who also attend. COFES is well-known for hosting leading keynote visionaries that bring a new perspective to the future of the industry. The central theme for COFES 2015 is that as engineers and software professionals we are good at focusing on the thing at hand – the design challenge; the need for a new tool; our competitive situation. However, rarely do we consider the bigger world in which these issues reside. This year, COFES takes a giant step backwards for broadening our view. In other words, to think about thinking about the bigger picture. The nature of our work requires that we spend the majority of our time getting things done, tightly focused on executing our tasks and plans. And while we do that, we are continuously faced with choices, big and small, along the way. Too often, we make decisions in the narrow context of what we have in front of us, unless some outside force pushes a broader context into our consciousness. A quick blast from the COFES past — In 2008 Gartner declared Augmented Reality (AR) one of the Top Ten Disruptive Technologies for the next few years. While AR has arrived on mobile devices and digital cameras, it remains imprecise and far from disruptive. Are there changes in the wind? Although the video below is a couple of years old, during his COFES 2011 presentation Joseph Juhnke reviews the strengths and weaknesses of various types of Augmented Reality (hardware and software) technologies.